If you have a known allergy to latex, rubber products or ammonia products, DO NOT USE Liquid Latex. Before using liquid latex, do a patch test. Apply a small amount on the inner forearm. Leave the latex on for approximately 15 minutes and then remove it. Check area 24 hours later. If there is a rash or itchiness discontinue use. If you experience itching or burning upon application then remove the latex immediately with plenty of soapy water and discontinue use. Full body coverage for avg. size person will require 32 oz. of Liquid Latex or 2 16 oz. containers. One 16 oz. container willl cover approximately 2 coats on a full body torso. Orange Liquid Latex 16 oz - Cover yourself in the sexiest outfit ever! 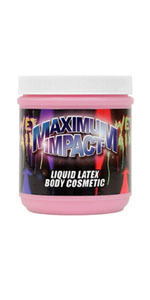 Maximum Impact Liquid Latex comes in a 16-ounce jar with screw off lid. Use a sponge brush (not included) to apply the latex to skin and in 5-10 minutes you will have a flexible body suit of your design. The all-natural Latex washes off with soap and water when you're done. Love the latex you're in! Flesh Liquid Latex 16 oz - Cover yourself in the sexiest outfit ever! Maximum Impact Liquid Latex comes in a 16-ounce jar with screw off lid. Use a sponge brush (not included) to apply the latex to skin and in 5-10 minutes you will have a flexible body suit of your design. The all-natural Latex washes off with soap and water when you're done. Love the latex you're in! Flesh Liquid Latex 32 oz - Cover yourself in the sexiest outfit ever! 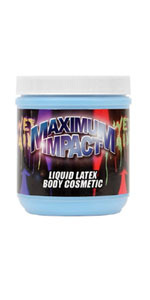 Maximum Impact Liquid Latex comes in a 32-ounce jar with screw off lid. Use a sponge brush (not included) to apply the latex to skin and in 5-10 minutes you will have a flexible body suit of your design. The all-natural Latex washes off with soap and water when you're done. Love the latex you're in! Fluorescent Liquid Latex shrinks as it dries (about 3% in 5-10 minutes after initial application). Fluorescent colors are less opaque under normal light, but GLOW BRIGHTLY UNDER BLACK LIGHT. Painting a flesh base coat before painting fluorescent colors is best if an opaque coverage is desired. More than 3 coats may also be necessary. Fluorescent Liquid Latex will totally dry in about 1 hour, and totally cure (ready to use) in about 4 hours. Foam application brushes are typically used for easily painting the liquid on all the targeted areas (we include these with all product shipments for your convenience). After the latex curing is complete, it is recommended that a slight layer of standard talcum powder be applied to the coating surface to prevent the latex from possibly adhering to itself. Flourescent Blue Liquid Latex 16 oz - Cover yourself in the sexiest outfit ever! 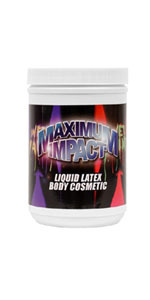 Maximum Impact Liquid Latex comes in a 16-ounce jar with screw off lid. Use a sponge brush (not included) to apply the latex to skin and in 5-10 minutes you will have a flexible body suit of your design. The all-natural Latex washes off with soap and water when you're done. Love the latex you're in! Flourescent Pink Liquid Latex 16 oz - Cover yourself in the sexiest outfit ever! Maximum Impact Liquid Latex comes in a 16-ounce jar with screw off lid. Use a sponge brush (not included) to apply the latex to skin and in 5-10 minutes you will have a flexible body suit of your design. The all-natural Latex washes off with soap and water when you're done. Love the latex you're in! Flourescent Red Liquid Latex 16 oz - Cover yourself in the sexiest outfit ever! 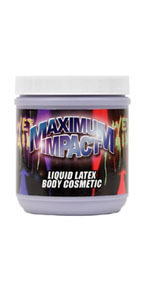 Maximum Impact Liquid Latex comes in a 16-ounce jar with screw off lid. Use a sponge brush (not included) to apply the latex to skin and in 5-10 minutes you will have a flexible body suit of your design. The all-natural Latex washes off with soap and water when you're done. Love the latex you're in! Flourescent Yellow Liquid Latex 16 oz - Cover yourself in the sexiest outfit ever! 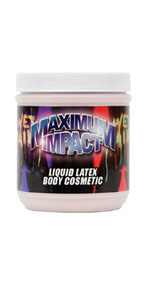 Maximum Impact Liquid Latex comes in a 16-ounce jar with screw off lid. Use a sponge brush (not included) to apply the latex to skin and in 5-10 minutes you will have a flexible body suit of your design. The all-natural Latex washes off with soap and water when you're done. Love the latex you're in! Flourescent Purple Liquid Latex 16 oz - Cover yourself in the sexiest outfit ever! Maximum Impact Liquid Latex comes in a 16-ounce jar with screw off lid. Use a sponge brush (not included) to apply the latex to skin and in 5-10 minutes you will have a flexible body suit of your design. The all-natural Latex washes off with soap and water when you're done. Love the latex you're in!